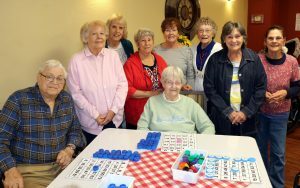 Elks Ladies Auxiliary Holds Bingo Night. OSWEGO, NY – Morningstar Residential Care Center welcomed members of Oswego Elks Lodge #271 Ladies Auxiliary for Bingo Night. The ladies visit Morningstar each month to treat residents to an evening of bingo, complete with prizes donated by Elks members. Seated are Leo and Mable Amyotte. Standing from left are Elks Auxiliary members Ann Pritchard, Vivan DeMent, Roberta Barbera, Pat Battelle, Fran Wadas, Sue Mills and Fran Ellsworth.